The Steps in Demolishing an Older House - Perry Hood Properties, Inc.
Moving into a historic neighborhood can be appealing, but moving into older homes can be problematic. Sometimes, demolishing a decrepit home in order to make way for new home construction can be a great way to have the best of both worlds as well as revitalized aging communities. In this piece, we’re going to look at the necessary steps in demolishing an older house to make way for new house construction. 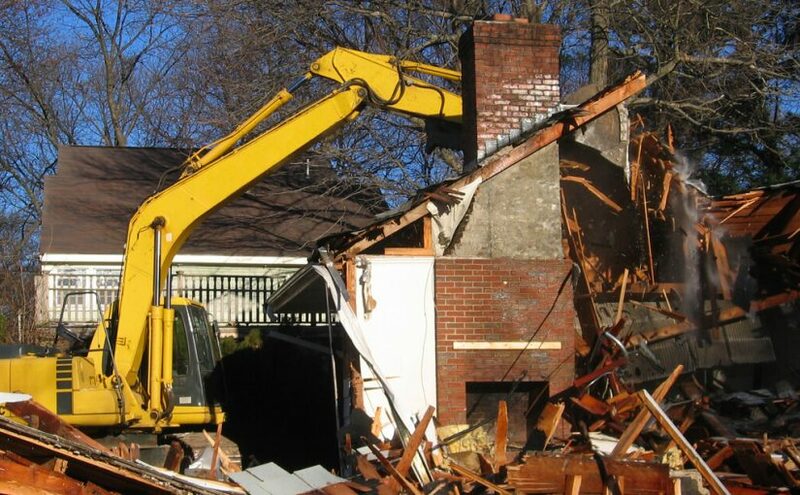 Before you start demolishing an older home, you’ll want to consider which method of demolition will be best. You may know precisely what you want in your new home and the older home is simply taking up space as well as time in your build plan. For scenarios where time is of the essence, a complete mechanical demolition with heavy mechanical equipment may be the quickest route. If you would like to recycle much of the older house’s material or possibly reuse any elements, manual deconstruction would be best. Many actually use both of these methods in tandem — recycling and reusing what they can while then demolishing the rest of the home with heavy equipment. If you’re reading this, there’s a good chance that you’re not already in the construction and demolition industry. For this reason, you will want to seek out the help of a demolition or construction contractor to help with the home’s teardown. Find a licensed and insured home construction specialist. Many of these homebuilders are also experienced in demolition but double-check by asking about similar projects they’ve completed before. Even though you’re tearing it down, it’s still crucial to have the home inspected for hazardous materials. Many older homes contain dangerous materials such as lead paint, asbestos, or mold. In order to stay safe and legal, you will want to deal with these before you begin your official demolition. Demolishing a house requires a lot of paperwork — especially if you plan on tearing down a house in a historic area. A city website or City Hall should able to outfit you with all of the paperwork you will need to fill out and submit in order to begin demolition. The house you’d like to remove is probably hooked up to a wide array of utility lines. Whether electric, sewage, water, or gas, this home will need to be disconnected from them all before demolition is to take place. Also, don’t forget unground septic and oil tanks that may be out of use that may need to be removed. Check with the utility companies as to the best ways to disconnect these lines and cap them off in a way that is safe and legal. Demolition is a loud and messy business. Make sure that you’ve spoken with the neighbors in the houses surrounding the home you plan to demolish. Give them all of the details surrounding the demolition including what time of day demolition will take place, how loud it may get, and how long it will take. The better you communicate now, the fewer angry voicemails you’ll receive later. Though your demolition contractor will already do this, make sure that potentially hazardous areas are all securely fenced off for the neighborhood’s protection. You want to make a good impression on your new neighbors. The best way is to keep them safe from your own property. After these bases are covered, the demolition process on your house can usually begin. Demolition usually takes anywhere from a day to a week depending on the size of the crew and the equipment used. Once the house is fully demolished, all remnants of the house should be completely removed — either by commercial refuse companies or recycling organizations. No trace should remain — not even the foundation. All that should be left is a spot of dirt where the house once stood. When you demolish a house, you’ve essentially punched an ugly hole into an otherwise beautiful neighborhood. For the sake of cost and momentum, you’ll want to start the new home construction process immediately. In order to custom-design the home of your dreams and build it out, look no further than your home construction at Perry Hood Properties. Every last detail can be altered to your liking for a house you’ll immediately want to come home to.